Do you want to prove your Spanish proficiency level in a quick and easy way? The SIELE Exam is an online Spanish examination aimed at students and professionals to help prove their degree of Spanish proficiency in a fast and easy way through its online registration, flexible exam process and fast results. With SIELE, candidates project their profile internationally and strengthen their admissions to training plans, universities and selection processes within various companies. Take a look at the menu questions to navigate the different sections. What is the Instituto Cervantes? Why should you take the SIELE exam? How can you register for the SIELE exam? How much does the SIELE exam cost? When and where can you take the SIELE exam? What can you expect on the exam day? When do you receive the SIELE results and how do they look like? How can you prepare for the SIELE exam? SIELE as a Spanish Proficiency Exam. SIELE is the Servico Internacional de Evaluación de la Lengua Española (International Assessment Service for the Spanish Language) and is an electronic means of proving your Spanish language proficiency. SIELE is a multi-level exam where each task presents a different degree of difficulty in Spanish, ranging from level A1 to C1 in accordance with the Common European Framework of Reference (CEFR), which standardises plurilingual education around Europe. Therefore, each exam question helps you discover your official proficiency level in Spanish. The SIELE is modular, so each candidate may choose between a complete Exam Certificate in Spanish or an individual Skills Report of the competency areas (Reading, Writing, Listening, Speaking). The SIELE Global exam consists of 4 tests corresponding to the four language communication competences and is the most complete modality to certify your level of Spanish proficiency. The independent SIELE modalities (S1 – S5) are created from four possible combinations of the Global exam and certify your Spanish language level of the communication part of your choice. The DELE Exam is considered the best official and international proof of your Spanish certification level, but is a bit more complicated to obtain. When taking the DELE exam, you need to decide on a specific proficiency level and take all four test areas together on a specified date. Alternatively, you can take the SIELE exam on a date of your choice, determine your proficiency during the examination and you don’t need to complete all sections of the tests if you so choose. The DELE gives you lifetime certification in Spanish proficiency, while the SIELE certificate is valid for up to 5 years. The SIELE exam is promoted by Instituto Cervantes, the National Autonomous University of Mexico, the University of Salamanca and the University of Buenos Aires. 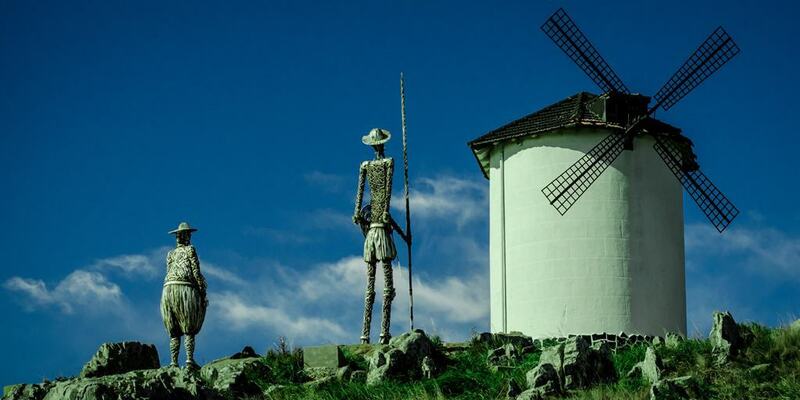 The Ingenious Nobleman Mister Don Quixote of La Mancha, written by Miguel de Cervantes, is considered the most influential work of Spanish literature and follows the story of a brave Spaniard throughout his journey to revive chivalry, undo wrongs and bring justice to the world. It is then no surprise that an institute whose main responsibility is to promote Spanish language and culture around the world would name their organization after one of the greatest writers in the Spanish language. Instituto Cervantes guarantees standards of quality and good practices in the preparation of Spanish exams, and ensures different usage of linguistic varieties in the Hispanic world – standards which are also practiced in various courses at FUIA. Fast and easy – Everything is managed electronically, which guarantees you will receive your results within a maximum of three weeks. You can then print the certificate straight from your computer or prove your proficiency with the secure verification code. Adaptable – You can choose between the most complete modality of SIELE Global or any of the 5 independent modalities. Flexible – You can decide when and in which exam centre you want to take the exam – there are no pre-established dates! Uniform – Because it is pan-hispanic, the exam includes different linguistic variations of Spanish. Good business – Companies and organizations can quickly find candidates that best adapt to their team through the SIELE verification code. Competent training – Universities and schools of business will be able to establish objectives, tools for measurement and control of the progress of learning and training based on SIELE results. World Recognition – SIELE is recognized by more than 75 associated organizations and universities in more than 20 countries, including Conference of Rectors of the Spanish Universities (CRUE), the Association of Language Centers in Higher Educations (ACLES), American Council on the Teaching of Foreign Languages (ACTFL) and the National Directory of Professional Certifications (RNCP). Why take an independent modality? Depending on whether you need to prove your Spanish proficiency for professional or academic reasons, it may only be necessary to take just part of the SIELE exam through one of its independent modalities. For example, some entities may only need to certify your level of Spanish oral expression and interaction, which you can do with the independent S4 modality in a 15-minute exam. Here you can obtain a report that supports your competence in a more affordable and less time-consuming manner than if you were to complete the entire SIELE exam. Be sure to consult your associated education or business institution before taking the exam to determine which option is best suited for your needs. A large number of Spanish universities require students to possess an official Spanish certificate to obtain an undergraduate and postgraduate degree. The required level varies from each university, but the most requested levels are B1 and B2 Spanish proficiency. 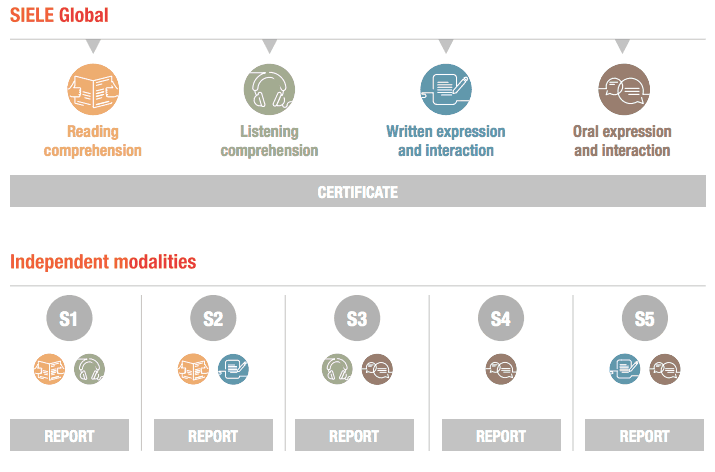 The different levels of the SIELE diploma are based on CEFR. 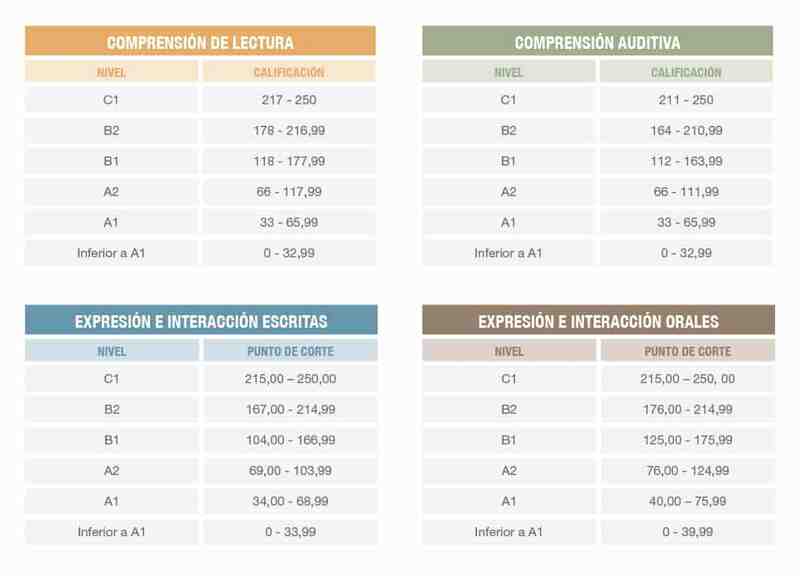 Here are the different proficiency levels from A1 to C2. What does each level prove? Use common day-to day expressions to communicate basic information. Have the ability to ask basic, personal questions. Interact in a basic fashion with natives given they talk slowly and clearly. Understand and use daily expressions concerning information relevant to your surroundings, including personal information, shopping and locations. Can address questions with reference to your immediate needs. Understand main ideas when listening or reading texts on topics such as studies and work or daily life, even when they may have slight variations in the language. 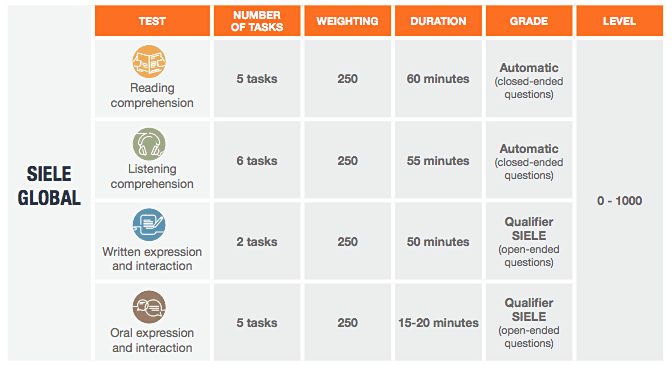 Be able to handle the majority of situations that take place in these familiar contexts. Write simple but coherent texts on familiar topics such as experiences, plans, wishes or opinions. Understand complex written and spoken texts even when they are abstract or technical, while grasping different variations of Spanish. Have the ability to interact with all types of Spanish speakers in a fluent and natural way, without hesitation. Write clear and detailed texts on several topics and debate your opinions. Process a wide variety of written and spoken text in every variation of Spanish, including implicit meanings, attitudes and intentions. Express yourself fluently, spontaneously and without apparent effort. Always find the adequate expression of every situation and context. Write complex texts with coherent structure and with a flexible and efficient use of Spanish. Handle any situation and understand everything written or spoken no matter how complex, abstract, unfamiliar or varied the expressions in Spanish may be. Express yourself spontaneously, fluently and with an exceptional semantic and grammatical precision in every context, be it academic or professional. 2. Select the country, date and examination centre in which you wish to obtain your SIELE certificate of Spanish. 3. Print your completed registration form with all required information and bring it to the exam center along with your stated identification on the day of your SIELE exam. You will need to present this information to the examiner. When and where can you take part in the SIELE exam? You can participate in the SIELE exam in more than 70 countries in over 300 centers around the globe – including here at FUIA in Puerto de la Cruz! You can select specific dates when searching for centres on siele.org, or by contacting the center directly to set up a time and date. At FU International Academy, we have SIELE exam dates published for each month. But if another date suits you better, we flexibly open up spaces for you. Just request an exam space by phone or email by filling out our contact form and selecting SIELE as the subject. To get a better understanding of what to expect for your SIELE Examination, click here to access the practice exam. But don’t worry! None of your results will be saved or evaluated on the demo exam, so you can practice as often as you’d like. On the day of the exam, be sure to go to the examination centre 15 minutes before the time of your exam and bring your official documents as well as your login credentials for siele.org (i.e. email and password). Your evaluation will be done electronically, with a maximum possible score of 250 points per section. You will be informed of the time left to finish throughout the examination. After the allotted execution time, the test is blocked and automatically advanced to the next one. This test consists of 5 tasks and has a total of 38 questions about reading and comprehension texts. In this test, you cannot navigate between tasks, so once one is finished, it automatically passes to the next one. The qualification is automatic and immediate. This test consists of 6 tasks and has a total of 38 questions formulated in an auditory manner. When you access the task, the audio plays twice automatically. The duration of the audio determines the total time for the completion of the task, offering enough time to answer each question. Once the audio phrase has elapsed, the task is blocked and automatically advances to the next one, which means you cannot return to a previous task. You can, however, go to the next task without listening to the full audio by clicking the “Siguiente” button. This test consists of 2 tasks and the answers given by the candidate are saved and later evaluated by accredited SIELE qualifiers. Here you have the freedom to move between the two tasks presented. This test consists of 5 tasks with questions formulated by text and speech which are answered orally through a recording system. Before you start, a sound recording test is performed to verify that your equipment is working properly. Your answers to each question is then recorded and later evaluated manually by expert linguists of SIELE. In a maximum time period of three weeks, you can download your certificate or SIELE report from “My Page” on siele.org. When taking the Global SIELE, you receive a certificate of international recognition, which includes a test score related to the levels of CEFR and a numerical score of 0 to 1000 based on the results of the sum obtained in each test. If you do any of the SIELE independent modalities, you receive a report that includes the score obtained in the test or tests carried out and its correspondence with the CEFR levels. In both cases, you will receive a certificate and report with a brief description of what a user of the corresponding level proficiency is capable of performing in the activity of the corresponding language. To facilitate the verification of these results by entities that want to know the level of Spanish of a candidate, a secure verification code is provided and inserted in siele.org, providing the candidate’s exam results. The SIELE platform itself provides exam preparation courses which include explainer videos, guided activities and a final test that simulates the actual exam. 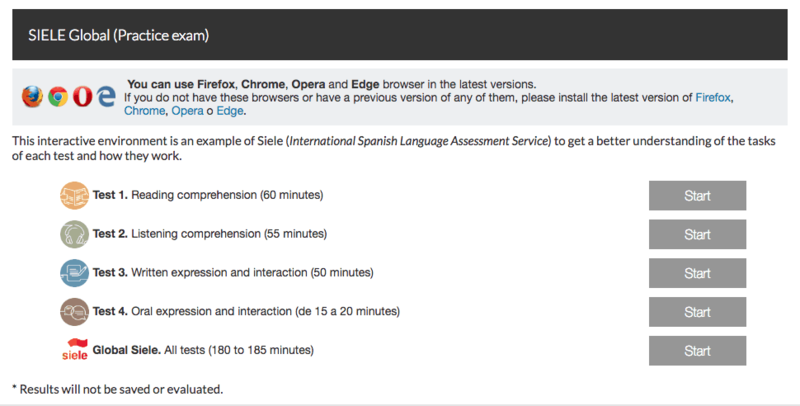 Once you sign up for one of the SIELE exams you have access to the preparation material of siele.org for free! They offer specific preparation courses for all 6 exam modalities. This allows you to focus exactly on what is important for you. If you want to start preparing yourself before paying for the exam, you also have the option to buy the single courses. They cost between €25 and €50. You can even register for a demo version for free for each SIELE objective online course. All courses are completely in Spanish including written explanations and videos. As they are self-study courses without a tutor, it’s recommended to have a minimum Spanish level of A2. As mentioned above, SIELE even offers free SIELE practice exams online for each exam module. It shows you exactly how the tests technically work and how the tasks look like. You see how many tasks and questions there are and the time runs while you perform the sample exam. Results won’t be saved or evaluated. It’s a great opportunity to establish a feeling for this computer based exam! If there is so much preparation material online and available for free, why should you pay for a SIELE exam preparation course with us? Well, there is one simple reason: We have highly qualified teachers! That means, you’ll receive professional tutoring while preparing for the exam. You have the chance to ask questions and to receive instant feedback. Taking part in our combination course of 20 intensive group lessons plus 5 or 10 individual SIELE exam preparation lessons has the advantage that you not only prepare for the exam, but you will also strengthen your current Spanish knowledge. This will give you even more confidence on the exam day. During the group lessons of the Intensive 20 course, you will broaden your vocabulary, grammar knowledge and communication skills. In the individual lessons our teachers will help you become familiar with the structure of the SIELE exam. You’ll perform different activities in order to establish a strategy that will help you optimise your results. You’ll practice with sample exams and we’ll focus on rehearsing with topics and vocabulary that may appear in the different parts of the exam. Our teachers and you will work together towards a common objective: getting the best possible results! You can prepare AND take the SIELE exam at our centre. You will get a discount of 75€ if you take our combination course and sit the exam at our Academy. Practice reading, writing, listening and talking in Spanish and receive instant feedback on how you are doing. 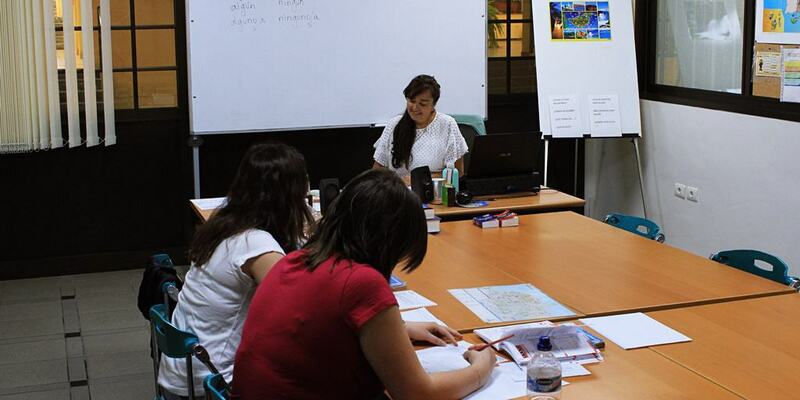 You will be trained by native Spanish speakers who specialize in teaching Spanish as a Foreign Language. We have exam dates published for each month. Or you can let us know up to 48 business hours before you want to sit the exam and we will publish the specific date for you. We will help you with the registration process for the SIELE exam if needed. So what are you waiting for? It’s never been easier to prove your Spanish proficiency, so sign up today, get your diploma and have the Spanish speaking world right at your feet! 370 queries in 3.036 seconds.